The Turks and Caicos typically has great weather. Rain clouds rolling in over the Turks and Caicos. 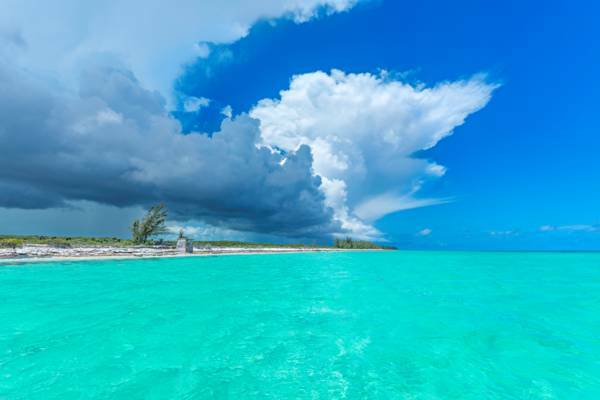 The Turks and Caicos is typically blessed with exquisite sunny days and warm balmy temperatures, and has one of the lowest average number of rainy days of any Caribbean country, yet there are times when the rain clouds roll in and wind speeds are high. If Grace Bay Beach is a little too choppy for your tastes, consider these other activities and attractions on and around Providenciales. When consulting the weather forecast, keep in mind that there’s typically less rain experienced than what’s predicted. When planning water sports such as snorkelling, diving, or paddle boarding, it’s better to look at the wind forecast, as breezy days may result in choppy water conditions. Wind speeds under 15mph (24kph) are best for most water activities. Another consideration is wind direction. As an island, there’s typically a windy side and a sheltered side to Providenciales. If the weather’s sunny, yet Grace Bay is rough, try the south and west coast beaches, such as Sapodilla Bay, Taylor Bay, Turtle Tail Beach, and Malcolm's Road Beach. The Crossing Place Trail on Middle Caicos during rough ocean conditions. Providenciales is the main island for tourism in the Turks and Caicos, yet we have many other islands as well, all of which are quieter and less developed. If discovering a wide array of natural and historical sights sounds like a great way to spend the day, then a day trip can be perfect for an overcast day. It’s fun and easy to visit North Caicos and Middle Caicos, South Caicos, Salt Cay, and Grand Turk for a day. Simply reserve your ferry or flight, book a rental car, and decide which sights you want to explore. North Caicos and Middle Caicos is generally our top choice for several different reasons; it’s simple to catch the ferry, both islands are connected by a road causeway, there are several car rental companies to choose from, and there’s a wide selection of beaches and attractions across the two islands. If you’re visiting our less-populated islands solely for their beaches, you’ll likely want to postpone until weather conditions improve. The grounds at the Cheshire Hall Plantation. The Turks and Caicos has had an interesting history, with the first permanent settlement in the archipelago centring around sea salt production on Grand Turk, Salt Cay, and South Caicos, but the larger and more verdant Caicos Islands supported a different industry – cotton planting. This later 1700s Loyalist industry brought the construction of expansive plantations, and at the height of the period there were dozens of elaborate farms, with names such as Belleview, Lorimers, and St. James. Today, only three plantation sites are open for tourism, Cheshire Hall on Providenciales, Wade’s Green on North Caicos, and Haulover on Middle Caicos. All of these sites only have ruins now, but it’s interesting to tour the grounds and see the remains of the great houses, kitchens, field walls, slave quarters and warehouses. The average tour of Cheshire Hall take between 1 and 2 hours. Anna's Art Gallery at the Saltmills Plaza, Grace Bay. Providenciales offers a great selection of art galleries and gift shops, and many of these are centred around a few plazas in the Grace Bay region. You’ll find a plethora of unique handmade crafts and original paintings. If you’re simply looking for a great T shirt, there are hundreds of designs to browse through. On the culinary side of the shopping spectrum is authentic Turks and Caicos salt, locally roasted coffee, Bambarra Rum, and Salt Cay candies. Exploring the national parks of Providenciales. There are several scenic drives on Providenciales which offer natural sights, coasts, and extravagant island villas. Venetian Road and Turtle Tail, which has recently been paved, winds through marine ponds and coastal bluffs. The view from the hill tops over the brilliant Caicos Banks is breath taking. Chalk Sound Drive is another great route. You’ll see the vibrantly turquoise water and small islands of Chalk Sound National Park, many beautiful villas, and Sapodilla Bay Beach is an easy stop as well. If you’d like to grab a bite to eat, Las Brisas on the picturesque lagoon is an ideal place. Blue Hills Road, which fronts the oldest settlement on Providenciales, is reminiscent of some of the southern Caribbean islands, with coconut palms, colourful buildings, and small handmade fishing boats. The Turk's Head Brewery tour. There are several smaller interesting attractions on Providenciales that can be visited in an afternoon. The Turk’s Head Brewery Tour is fascinating, and exhibits an efficient microbrewery in operation. The onsite taproom bar is great for sampling the various flavours, including unique brews and seasonal specials, and the front shop is the cheapest place in the country to buy beer! The brewery is indoors, which is perfect when it’s raining. The Hole in Long Bay Hills is another amazing site. This natural feature was formed by the Karst Process of dissolution, and was previously a large cave before the ceiling collapsed previous to recorded history. If you’re interested in caves, we have Conch Bar Caves on the island of Middle Caicos, which is one of the largest dry cave systems in the Caribbean, and the Ocean Hole, the widest blue hole in the world! On a small bluff overlooking Chalk Sound, Sapodilla Bay, and South Dock are the Sapodilla Hill Rock Carvings. These inscriptions were left in large rocks and the limestone bedding by sailors and travellers in past centuries, and exhibit dates, ships names, outlines of vessels and buildings. Unfortunately, vandalism and abuse has greatly diminished these historical artefacts, yet the views are still beautiful. Please take care not to step on any of the inscriptions, and please don’t graffiti. Another idea is the National Museum and Heritage Site in Grace Bay. The Turks and Caicos has had a small yet select museum on the island of Grand Turk for decades, and now ground breaking has taken place for a museum branch on Providenciales as well. Currently the main exhibit of the Providenciales branch of the National Museum focuses on an outdoor replica of a post plantation-era home and garden, and is essentially a small living museum. There’s also a cannon, outdoor exhibits on the Caicos Sloop, and centuries-old anchors. It’s always exciting to try a new sport, and learning to kite is a stellar way to take advantage of a breezy day. Modern kiteboarding equipment has come a long way, and almost anyone can participate. Long Bay Beach on Providenciales is one of the top kite spots in the Caribbean, with shallow turquoise water and a soft sandy ocean floor heading out for miles. It’s unforgettable to speed across the ocean and jump, solely under the power of the wind. Beginners are often able to function on their own after 3-5 lessons.